Couscous, popular in Moroccan cuisine, is generally served steamed, along with some vegetable or meat gravy. 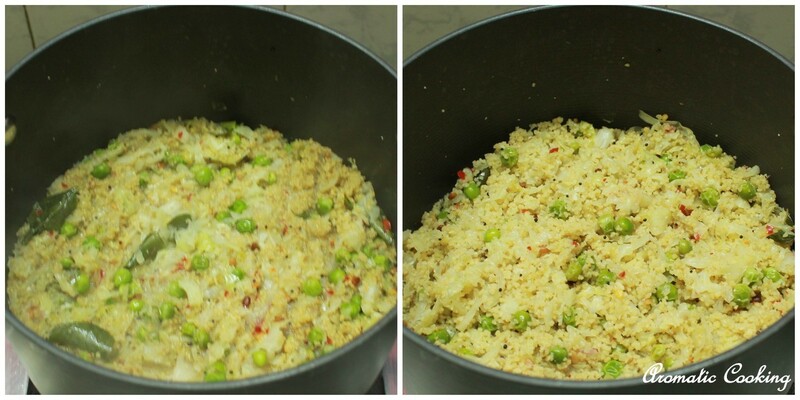 While reading about it, I came to know that the box of couscous that we get is actually precooked and dried, so all that we do is, add it to boiling water, cover and switch off and leave it for about 5 to 10 minutes. So it's very easy to prepare and when cooked with some vegetables, makes a complete meal, whole wheat couscous is also available, making it more healthier. 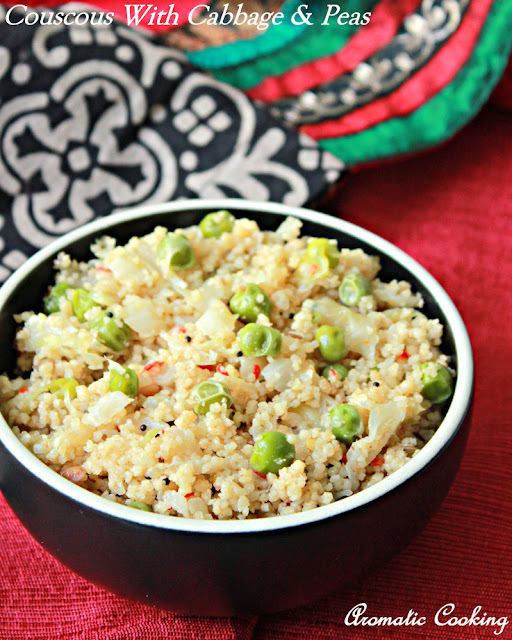 I have made this dish with an Indian flavor, it tasted very good and was done in minutes.. 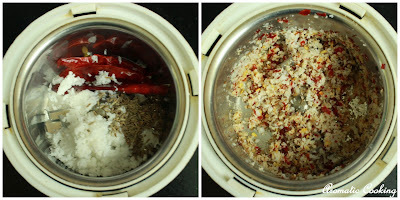 Grind coarsely all the ingredients given under ' to grind ', without adding any water. Heat some oil, add the urad dal and the mustard seeds, when it starts spluttering, add the asafoetida, followed by the shredded cabbage. Mix for half a minute, add the peas and the curry leaves, keep sauteing it for about 5 minutes, the cabbage and the peas should be half cooked. Now add the ground mixture, mix and add about 1 and a half cup of water. When it starts boiling add the couscous. Mix well, cover with a lid, switch off and leave it undisturbed for 5 to 10 minutes. Fluff it with a fork and serve. 4 cups of cabbage might look like a lot, but when sauteed it shrinks, and also more cabbage gives a nice taste to the dish. If cooked like this, the cabbage retains a slight crunchiness, which goes well with the couscous, you can also add some roasted cashews or peanuts for an extra crunch. Interesting recipe..i have some more couscous left. Shall try it soon! 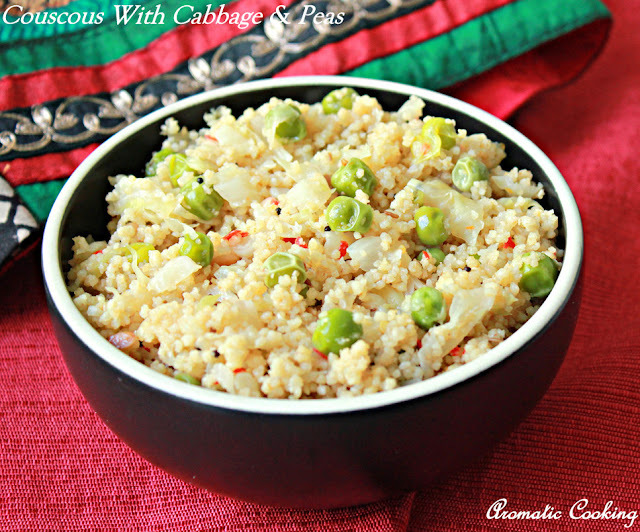 Which veggie can be substituted instead of cabbage Hema? I like the idea of couscous with cabbage and peas. loved the cute pearls,yummy fiber rich n healthy!! Love the Indian touch you have given to the couscous.. Very healthy dish! Looks delicious. I am a big fan of couscous. I make them all the time.